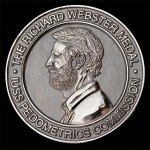 The Richard Webster Medal: an award by the Pedometrics Commission of the International Union of Soil Sciences. The Richard Webster medal was established before the 2002 World Congress of the International Union of Soil Sciences (IUSS). The award is for the best body of work that has advanced pedometrics. Richard Webster was born in1933 in Derby (England). The start of his career as the founder of pedometrics began with a degree in chemistry from the University of Sheffield (1954), followed by studies in soil science and statistics at London University and Rothamsted Experimental Station. From 1957 to 1961 he led the soil survey in Northern Rhodesia, and while there he introduced air-photo interpretation based on physiographic understanding to accelerate survey. He continued with this theme to find means of spatial prediction of soil properties for his doctorate at Oxford University (1966). During the 22 years (from 1968) at Rothamsted Experimental Station he continued to develop statistical pedology. Of major importance, he adapted the theory of regionalized variables to soil survey for optimal spatial prediction of soil properties from sparse sample data. It was this work, in particular, that led to the development of what we now know as Pedometrics. During this period Richard supervised several PhD students two of whom went on to work in Pedometrics, namely Alex McBratney and Margaret Oliver. Richard continued his role in educating pedometricians (Andreas Papritz) at the Swiss Federal Institute of Technology. He has continued to apply statistical theory to practical problems in soil pollution, precision agriculture, and spatial filtering since his retirement. The Richard Webster Medal: an award by the Pedometrics Commission of the International Union of Soil Sciences The Pedometrics Commission of the International Union of Soil Sciences (IUSS) has decided to award a medal for the best body of work that has advanced pedometrics (the subject) in the period between consecutive IUSS World Congresses, i.e. over a period of four years. However, achievements before that period will also form part of the evaluation (see more detail below). The award will be made at each meeting of the IUSS World Congress. It was suggested that this award should be called the Richard Webster Medal. The Pedometrics Committee on Prizes and Awards was established in 2006 and it comprises a chairman and four other members. The committee members shall preside over two awards. On retirement of the Chairman of the Pedometrics Committee on Prizes and Awards, the existing Chairman will recommend one of the existing committee members to the Chair and Vice-Chair of the Pedometrics Commission for the appointment to be made. Proposals for two new members of the Committee can be made by the existing committee members and the Chair and Vice-Chair of the Pedometrics Commission. If a vote is necessary, that of the Chair and Vice-Chair of the Pedometrics Commission will count as a single vote. The first award of this medal was made to Professor Alex McBratney (University of Sydney, Australia) at the 18th IUSS World Congress in July 2006 in Philadelphia (USA). The second award was made to Dr Jaap de Gruijter (Alterra, Wageningen University and Research Centre, Wageningen, The Netherlands) at the 19th IUSS World Congress in August 2010 in Brisbane (Australia). The third award was made to Dr Gerard Heuvelink (Wageningen University, The Netherlands) at the 20th IUSS World Congress in June 2014 in JeJu (Korea). and service to pedometrics (e.g. by serving on a committee of the Pedometrics Commission or promoting pedometrics to the IUSS). A nominee should be a member of the IUSS at the time of the nomination and have been involved in activities associated with pedometrics, in particular.The nominee must be living at the time of the selection; retired pedometricians still active in pedometrics research will be eligible for the award. The nominee should be willing to receive the medal at the time and place designated by the IUSS World Congress, and be a keynote speaker at the next conference of the Pedometrics Commission (held biennially) following the presentation of the medal. Members of the Awards and Prizes Committee shall be ineligible to receive the medal while serving on the Committee. The award of the Richard Webster Medal shall not be presented to any one individual more than once. The recipient of the Medal will accept an engraved medal, a certificate and a prize of US$ 500. Nominations for the Richard Webster Medal should be made by a colleague or colleagues who know the person’s work well. The nomination should include a résumé and a short statement (a maximum of 750 words) summarizing the relevant qualifications of the nominee with respect to the conditions outlined in the section, requirements and eligibility, above. and leadership and management of research projects . Inclusion of any of the above must show clear relevance to pedometrics. The Pedometrics Committee on Awards and Prizes shall comprise a chairman and four other members. The committee members shall preside over two awards in general. The chairman of the committee will be asked to preside over the award of one medal only to allow some continuity in the procedure. The newly appointed chairman (following the award of the Medal) will recommend two new committee members to the committee of the Pedometrics Commission. The aim should be to balance the representation of the main continents of the World in the choice of suitable committee members. 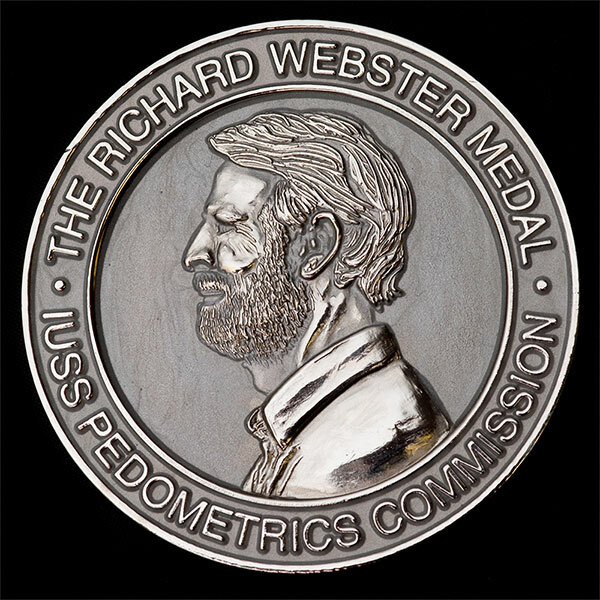 The Pedometrics Committee on Awards and Prizes will publicize a request for nominations for the Richard Webster Medal in the Pedometrics Newsletter, on the Pedometrics Commission website, and in other appropriate places a year before the next IUSS World Congress. Each member of the Pedometrics Committee on Awards and Prizes will evaluate all submissions by all nominees. The evaluation will be on a scale from 0 to 10 for the criteria outlined above (section 2 of the nominations procedure). The winner of the medal shall be the nominee who receives the most points. In the event of a tie, the chairman of the Committee shall cast the deciding vote. When the submission has been evaluated, the Chairman of the Pedometrics Commission should write to the winner, other nominees and the IUSS secretariat to inform them of the outcome.